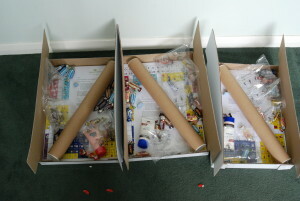 The ‘care packages’ we sent to care homes. We’ve been working hard on the Essex Challenge Prize, and today we’ve done a fair amount of restructing of our online information about the project. You can read about our plan, our progress, and how we are getting on by starting with this page on the eQuality Time wiki. That will link you to all of our subprojects, Dropbox Directories, and research. We’re trying to make more use of this sort of structure. Blog posts and tweets are all very good for showing the sucesses of an organisation, but we really want to show the steps we take, the errors we make, and show the complete narrative – and for that sort of approach you really need to be using public issues and wiki pages. We hope you like reading about it!